Ashiq Masih has the look of a hunted man – gaunt, anxious and exhausted. 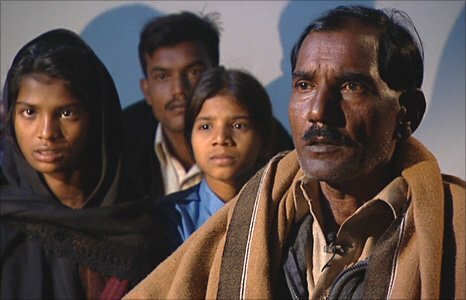 Though he is guilty of nothing, this Pakistani labourer is on the run – with his five children. His wife, Asia Bibi, has been sentenced to death for blaspheming against Islam. That is enough to make the entire family a target. They stay hidden by day, so we met them after dark. Mr Masih told us they move constantly, trying to stay one step ahead of the anonymous callers who have been menacing them. “I ask who they are, but they refuse to tell me,” he said. “They say ‘we’ll deal with you if we get our hands on you’. Now everyone knows about us, so I am hiding my kids here and there. I don’t allow them to go out. Anyone can harm them,” he added. Ashiq Masih says his daughters still cry for their mother and ask if she will be home in time for Christmas. He insists that Asia Bibi is innocent and will be freed, but he worries about what will happen next. “When she comes out, how she can live safely?” he asks. Asia Bibi, an illiterate farm worker from rural Punjab, is the first woman sentenced to hang under Pakistan’s controversial blasphemy law. ‘Old score’ As well as the death penalty hanging over her, Asia Bibi now has a price on her head. A radical cleric has promised 500,000 Pakistani rupees (£3,700; $5,800) to anyone prepared to “finish her”. He suggested that the Taliban might be happy to do it. Asia Bibi’s troubles began in June 2009 in her village, Ittan Wali, a patchwork of lush fields and dusty streets. Hers was the only Christian household. She was picking berries alongside local Muslim women, when a row developed over sharing water. Days later, the women claimed she had insulted the Prophet Muhammad. Soon, Asia Bibi was being pursued by a mob. “In the village they tried to put a noose around my neck, so that they could kill me,” she said in a brief appearance outside her jail cell. Asia Bibi says she was falsely accused to settle an old score. That is often the case with the blasphemy law, critics say. At the village mosque, we found no mercy for her. The imam, Qari Mohammed Salim, told us he cried with joy when sentence was passed on Asia Bibi. He helped to bring the case against her and says she will be made to pay, one way or the other. “If the law punishes someone for blasphemy, and that person is pardoned, then we will also take the law in our hands,” he said. Her case has provoked concern abroad, with Pope Benedict XVI joining the calls for her release. In Pakistan, Islamic parties have been out on the streets, threatening anarchy if she is freed, or if there is any attempt to amend the blasphemy law. Under Pakistan’s penal code, anyone who “defiles the sacred name of the Holy Prophet” can be punished by death or life imprisonment. Death sentences have always been overturned on appeal. While most of those charged under the law are Muslims, campaigners say it is an easy tool for targeting minorities, in this overwhelmingly Muslim state. Pakistan’s Christian community has been praying for Asia Bibi. “It is a hanging sword on the neck of all minorities, especially Christians,” says Shahzad Kamran, of the Sharing Life Ministry, which ministers to prisoners, including Asia Bibi. “In our churches, homes and workplaces we feel fear,” he says. “It’s very easy to make this accusation because of a grudge, or for revenge. Anyone can accuse you. Asia Bibi’s story has sparked a public debate in Pakistan about reforming the law, but it is a touchy – and risky – subject which many politicians would prefer to ignore. Campaigners fear that the talk about reform of the blasphemy laws will amount to no more than that. Beheading threat When Pakistan’s Minister for Minorities, Shahbaz Bhatti, raised the issue six months ago, he was threatened with death. “I was told I could be beheaded if I proposed any change,” he told us. “But I am committed to the principle of justice for the people of Pakistan. I am ready to die for this cause, and I will not compromise”. Mr Bhatti, himself a Christian, hopes that Asia Bibi will win an appeal to the High Court, or be pardoned by Pakistan’s President Asif Ali Zardari. He says she is one of dozens of innocent people who are accused every year.”I will go to every knock for justice on her behalf and I will take all steps for her protection”. But even behind bars Asia Bibi may not be safe. Several people accused of blasphemy have been killed in jail. Thirty-four people connected with blasphemy cases have been killed since the law was hardened in 1986, according to Pakistan’s Justice and Peace Commission, a Catholic campaign group. The death toll includes those accused, their relatives, and even a judge. In a neglected graveyard by a railway track in the city of Faisalabad, we found two of the latest victims of the blasphemy law. ‘Electric shock’ They are brothers, buried side by side, together in death, as they were in life. His brother, Sajid, was an MBA student. They were gunned down in July during their trial – inside a courthouse, in handcuffs and in police custody. Relatives, who asked not to be identified, said the blasphemy charges were brought because of a land dispute. After the killings, the extended family had to leave home and move to another city. They say they will be moving again soon. Once a month they come to the cemetery to pray at the graves of their lost loved ones. They are too frightened to visit more often. They bow their heads and mourn for two men who they say were killed for nothing – except being Christian. This entry was posted in Islamists, pakistan. Bookmark the permalink.